3 new Block kits! They will only be available through July…..
We have a beautiful new model, thanks to our wonderful Betsy. Comments Off on Patriotic is one of our favorties…. Patriotic is one of our favorties…. We have really great patriotic models at the shop. You must come in and see them. Comments Off on Lost and Found…. Have you ever lost something and it drove you crazy! It happened to me recently. I was working by myself and had turned on the TV during lunch. After lunch I tried to find the remote to turn off the news. I couldn’t find it anywhere. So just turn it off at the set right? Well, I couldn’t find any buttons at all! No on/off, no volume, nothing. Did I put it in a customers bag? Did I fold it into a bag of linen? This is CRAZY! I searched and searched. I decided the only way to use the TV now would be to unplug and plug it in when we wanted to use it. Of course we could only watch channel 2 forever now. Well guess where it was…. How in the world did it get there?! In the arm of the couch! Whew, I was afraid that we would never get to watch Elen again…..
What a beautiful book! This newly published book is wonderful for any stitcher who wants to learn how to work some unique counted background stitches as well as a number of surface stitches. 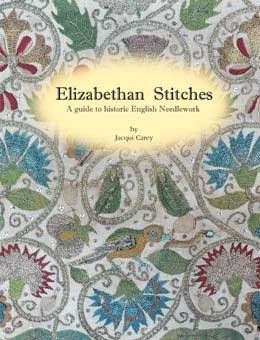 The author has gone to the original stitched pieces from the Elizabethan era and charted the stitches with big clear drawings. She includes beautiful photos of both the front and back so you can see just how they should look. The stitches are grouped into needlepoint, braid and looped stitches. This is a must have book for any one who has tried to work plated braid. The instructions are clear and make the stitches easy to do. We have sold many of these books already….the serious stitchers are just thrilled with it!